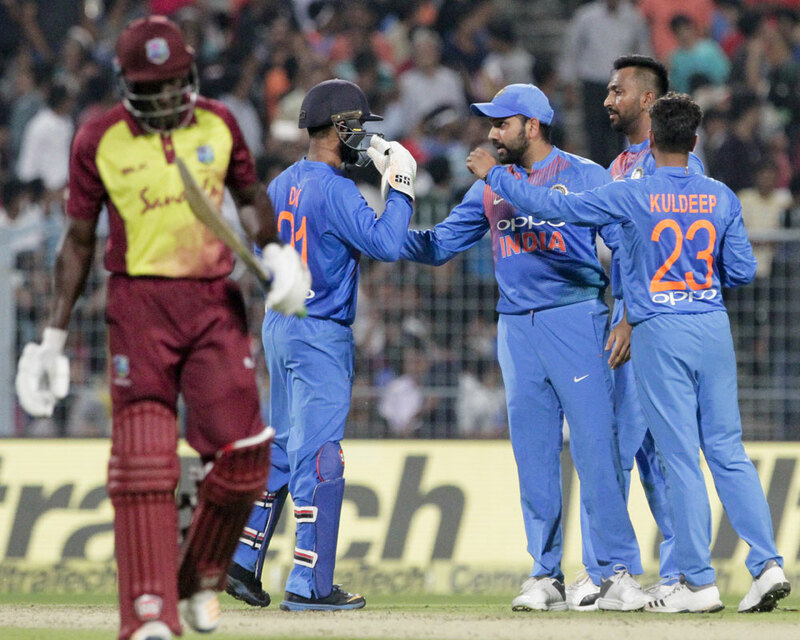 The misery has seemed never-ending for the West Indies and India would look to ensure that the script doesn't change when the two sides clash in the second Twenty20 International here on Tuesday. India's four-match T20 losing streak against the West Indies ended on Sunday in Kolkata. And in the penultimate game of what has been a disastrous tour for the visitors, India would be favourites to lock the series in their favour. The five-wicket win in Kolkata might have looked a bit laboured for the hosts but the absence of batting talisman Virat Kohli cannot be discounted. Rohit Sharma is leading the side in Kohli's absence and the 31-year-old and usually he has thrived in responsibility. But Sunday was a rare failure for the Mumbaikar and he would look to make up for that with a big knock tomorrow. Besides Sharma, opener Shikhar Dhawan, KL Rahul, the young Rishabh Pant, and Manish Pandey also had a bad day in office in the series-opener. It took a responsible 34-ball 31 from Dinesh Karthik and a nine-ball 21-run unbeaten cameo from newcomer Krunal Pandya to steer India home in 17.5 overs. But come Tuesday, Lucknow, which is hosting its first international match at the newly-built Ekana Stadium, would be eager to see a more dominant performance from the home team, one that's befitting the gulf in quality between the two sides. Pace spearhead Bhuvneshwar Kumar is expected to be back after missing the first game due to gastric problem. Umesh Yadav might have to make way for Bhuvneshwar as Jasprit Bumrah and young Khaleel Ahmed look certainties at the moment. West Indies, on the other hand, would be desperate to return home with some positivity at the end of a two-month long series in which they lost both the Test and ODI series. While two-Test series was lost 0-2 in just six days of action, they posed some challenge in the subsequent ODI series before being thrashed 1-3 with a nine-wicket loss in Thiruvananthapuram in the final one-dayer. The return of big names such as Kieran Pollard and Darren Bravo failed to make any significant impact as West Indies produced a below-par batting effort on Sunday. Andre Russell's injury, which ruled him out of the series, has also dented their chances.